The risks and opportunities related to advances in technology are so extensive that technological development can’t be left solely for companies and engineers. Technology should be considered as a social issue as well: it’s changing both the way societies are organised and how they should be organised. To share the benefits of new technologies more equally, we can no longer focus solely on developing technology: we need to change social institutions as well. Big technological advances, while having beneficial consequences, can also alter and severe societal tensions. There are historic examples of this. The advent of the steam engine during the Industrial Revolution brought with it more efficient travelling and factories, but also pollution and later climate change. 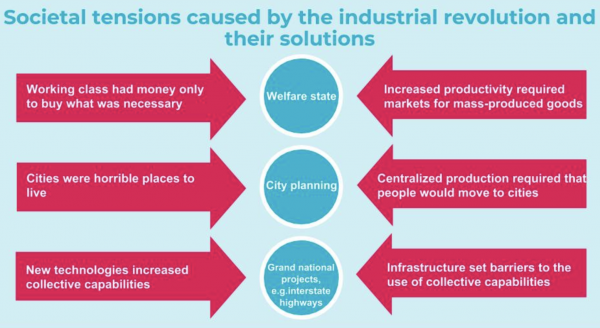 Rapid urbanisation led to the appearance of both slums and creative cities, and while new jobs were created for millions of people, we were also left with new social problems such as unemployment and urban poverty. Those problems were not solved until new societal institutions were created. And the full potential of new technologies couldn’t be utilised until the tensions were solved. Visiting Professor of London School of Economics, Carlota Perez has described this as life and times of a technology. Societal problems created by the Industrial Revolution were eventually mitigated by social security systems ensuring that the increases in industrial productivity also increased the wellbeing of workers. This also meant that more people were able to afford all the new products created with new technologies which grew the economy and further accelerated the development of new technologies. We can reflect this back to the technological developments of today. As we are in the midst of a transition to a post-industrial society, we need to shape current social institutions and create new ones that address current and future societal tensions. With adapting and reorganizing our societies we can make sure that we release the full potential of new technologies. ← How to build trust in the world, where tech giants are more powerful than governments?